Well, times have changed. Both residents of neighboring New York boroughs and city visitors are now being regularly lured to Queens by its unparalleled ethnic culinary scene, cultural happenings, ever-growing artist community, and unique events. Neighborhoods like Long Island City and Astoria have grown tremendously in stature and visibility given their proximity to Manhattan, just across the East River. However, repeat visitors to the borough may be in search of less-trodden terrain. Real estate agents and developers love to tout “new” and “undiscovered” areas in order to heighten the value of older properties or to sell shiny newly built condos. However, a NYC explorer looking to experience a neighborhood for pleasure and knowledge may have a much more innocent agenda when seeking new lands to explore. So, for the uninitiated and curious, here are two “up-and-coming” (for now) neighborhoods to visit in Queens. One of NYC's biggest melting pots — with parts of the neighborhood dubbed "Little India" or "Himalayan Heights," thanks to its large contingent of Indian, Bangladeshi, Pakistani, Tibetan, Bhutanese, and Nepalese residents — Jackson Heights has long been on the radar with serious foodies for its authentic ethnic eateries. Indeed, the quarter is positively littered with delicious culinary finds, whether you wander into the popular Jackson Diner for Indian, or seek out momos and other Himalayan specialties in spots like Himalayan Yak. There are plenty of other Asian and South American transplants who call Jackson Heights home, too — you can have a (literal) taste of their culture, as well, whether sipping on a perfect Peruvian pisco sour at dedicated pisco bar Amaru, or tucking into Korean-style fried chicken at UFO (Unidentified Flying Chickens). But in recent years, this old neighborhood has found new flair that extends well beyond its kitchens, with a fresh wave of residents and visitors drawn by a combination of the neighborhood's great subway access (it's just 30 minutes from Grand Central on the elevated 7 train) and charming architecture (which proposes comparatively affordable NYC real estate for those looking to buy). 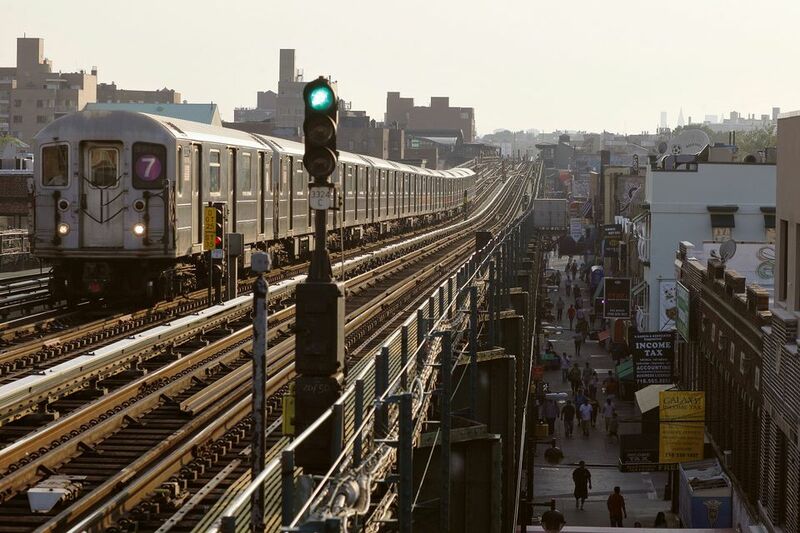 Some of those properties fall within the lovely Jackson Heights Historic District, which runs from the east side of 76th Street to the west side of 88th Street, and from Roosevelt Avenue to Northern Boulevard. A planned community of historic 1920s "garden apartments," it comes littered with block after block of well-crafted pre-war buildings, nearly all of which tout shared private garden spaces — it's a pleasure to simply stroll through the neighborhood and admire its design and pleasant pace of NYC life. Hundreds of years ago, Woodside was quite the unhospitable landscape, referred to by early European settlers as “Wolf Swamp.” Since then (and putting political jokes aside), the swamp was indeed drained, and in its place grew agriculture, and, eventually, more people, before blossoming into a bona fide residential neighborhood. Today that neighborhood is conveniently serviced by loads of NYC mass transit (including several subway lines and the Long Island Rail Road), while, by car, the BQE and Long Island Expressway are easily accessible, too. With so many transportation options, and reasonably priced housing, Woodside — like other Western Queens neighborhoods of late — has become a magnet for young domestic transplants looking to set roots in NYC, or for new immigrants eager to seek out the comfort and familiarity of the already-existing communities here that speak their language and share their culture. Speaking of immigrant populations, Woodside once held one of the largest Irish communities in all of Queens, and still has a significant Gaelic atmosphere in several parts of the neighborhood. On Roosevelt Avenue, local favorite Donovan’s Pub touts one of the best burgers in the city and a distinctive Irish feel, as do nearby Saints & Sinners and Cuckoo's Nest. And at the intersection of Woodside Avenue and 60th Street, you’ll find Sean Og’s, a colorful Irish tavern that looks like it was airlifted from Ireland and set down in Queens. If you love Thai food, find your way immediately to Woodside's celebrated SriPraPhai. What started as a tiny little eatery offering a seemingly impossible offering of authentic Thai dishes, it's now grown into a much larger space to match its popularity, including a charming backyard (that's open seasonally). Their menu is voluminous — it's well worth experimenting beyond the staples. Between 63rd Street and 71st Street on Roosevelt Avenue, you’ll additionally encounter the heart of “Little Manila,” an enclave of Filipino restaurants and shops set up to serve their small local community. If you’re looking for Filipino cuisine, including the unfamiliar flavor of purple-yam sweets, do make your way to these parts: Krystal’s Café and Pastry Shop is a good starting point. Apart from the multitude of ethnic eateries, bars, and shops that make Woodside worth exploring, there are some newer wider-in-scope endeavors, too, like the Project Life Center, which has a mission of providing holistic experiences and education for the wellbeing of the entire community. While it's focused primarily on women, in the spirit of inclusivity, they host a "Wednesday Mensday," too, which welcomes participation and membership from men, as well. Topaz Arts, meanwhile, offers exhibition and performance space for multidisciplinary arts; it's one of the first to open in the neighborhood, in what will likely be a growing scene for NYC artists and art lovers.